Great new site and book from SOG Medic Steve Perry, we have an interview coming up with him soon. Some amazing pictures on this site, well worth a visit. Michael Stahl (on the right) was the 1-0 of RT Michigan out of CCN and has been in contact with us, this is his site. Great site from John Stryker Meyer and John E. Peters, both veterans of SOG. The book has links to the books they have published Over The Fence (out of print but soon to be updated and reprinted) and On The Ground. Both of these are essential reading. Great site from Chris Lloyd covering multi-peroid militaria with some great SOG items. Great site and run by a real nice chap, he does a great line in repro paperwork and US and Oz rations. Quick service too. RT Vermont One-Zero Lee Burkins site, its a must visit site and his book is one of the most inspirational I have read. He has been helping us with getting our recreations of SOG RT's right. The Montagnard Health Care Assistance Project (MHCAP) is a volunteer organization dedicated to establishing self sustaining programs relating education and health care access for the US Montagnard population. While newly arriving Montagnards are authorized access to a government run health insurance program, they typically lose eligibility rapidly as most enter the work force very soon after arriving in the United States. This combined with a lack of disease prevention education, easy access to a primary care provider, lack of employer based health insurance and illness/injury aggravation due to the stresses associated with immigration from Vietnam can culminate in a health crisis for these remarkable people. really interesting link to a site about the communications satellites based in Vietnam, this one about the one sited at the Special Forces camp at Binh Tan, which was an outpost of the 5th Special Forces unit A502. Not much content but really interesting photographs. Interesting site about Special Forces team A-502, "the largest A-Team in the world". A site detailing the history of B-52 Project Delta. 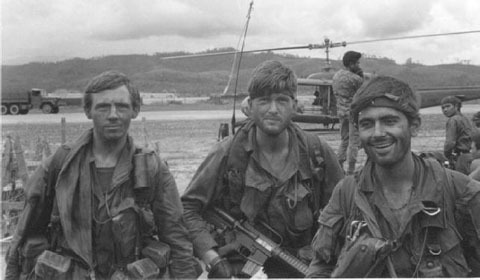 New site for UK based Living History Association / Re-enactment group who's impressions are based on the LRRP'S / LRP's / Rangers of the 101st Airbourne Division who served their country in Vietnam between the years of 1965 to 1971. Great bunch of guys. The team spend a lot of time here, very friendly and knowledgeable people. Website from Vietnam veteran and militaria collector in the States, amazing collection of Eastern Bloc weapons. A great site for the basics on uniforms, equipment and weapons used during the Vietnam War. Great group from Poland, great attention to detail and lots of shots taken with a Olympus Pen EE2 Camera. great source for replicas of the weapons used by SOG, very helpful chaps as well. And the map page on the site is really interesting. Great site from Japan, some interesting MACV-SOG related reproductions. More maps of Vietnam with contextual information overlaid. Great pictures on this site from SOG 1-0 Lee Burkins. Some great guys here, and they do an amazing show at War & Peace.